Over this past weekend my daughter was down with some sort of ailment. 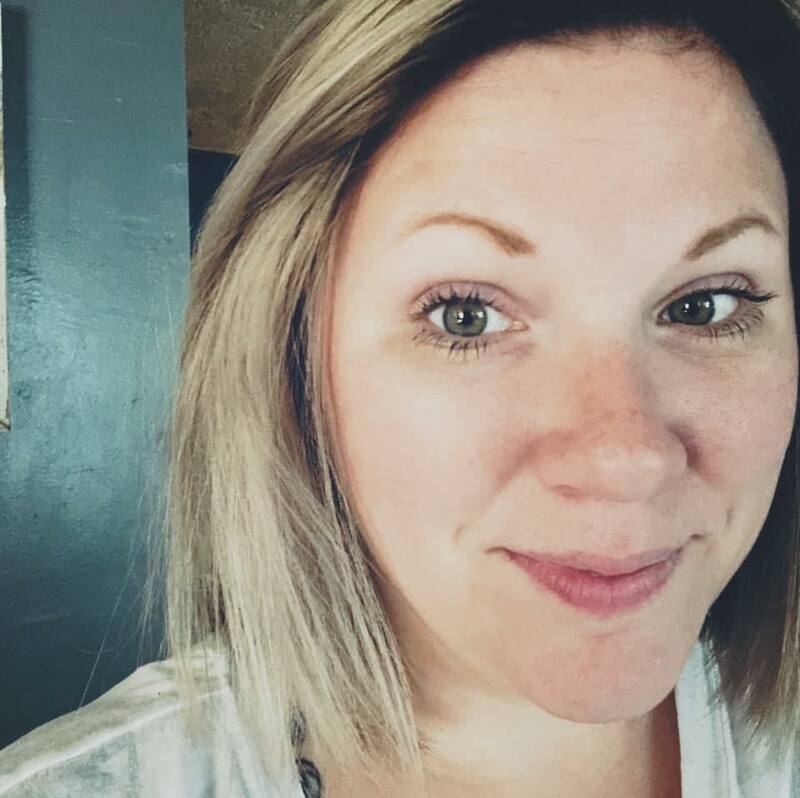 It wasn't strep throat, wasn't ear infection...yet it was something that made her wail out in pain and couldn't move her neck due to swelling. I can't stand to my little lady not feeling well, so when we had to pick up some new pain reliever (seriously, why does it expire so quickly?) we also tossed a nice fluffy pillow, a new Frozen blanket, a fluffy heating pad, ice cream, and a movie in the cart. We then spent the entire weekend in bed or on the couch lounging around. On Sunday morning the hubs went out for a morning hunt and I was itching to make something to snack on during the day. 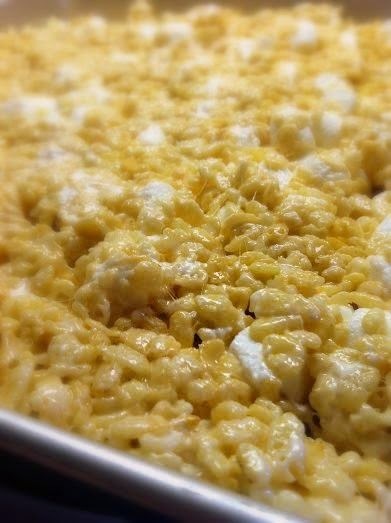 I decided to make some Rice Krispie bars. But...I wanted something utterly delicious. I mean, gooey. Marshmallowy. Soft. Have you ever had a Rice Krispie bar that was hard and it ripped up your mouth? Well, I wanted something soft and tasty. 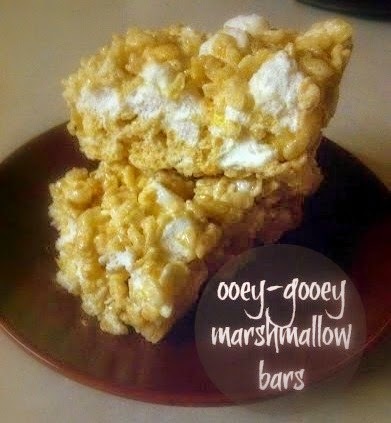 So, my daughter and I (luckily she was able to get out of bed without bawling in pain that morning) set to work making these delicious Ooey-Gooey Marshmallow Bars. We kind of made these by mistake actually. I had every intention to not use near as many marshmallows as we did, but my daughter is trying to figure out the whole "stop pouring something out when the measuring cup is full" thing. However, without her doing what she did, these wouldn't have been near as wonderful as they are. The hubs came home and yelled out from the kitchen, "can I eat these?" Because, well I bake a lot for special orders and typically he isn't allowed to eat anything in the kitchen cooling. I told him yes and his reaction? "Oh my God! Why haven't you made these before?" After his next bar..."these are so good." Then his next..."seriously, these are really good. Make these any time." They are fairly inexpensive to make (even though we used 2 1/2 bags of mini marshmallows). Each bag cost 98 cents, and crisp rice cereal (generic all the way) is inexpensive also. I love treats that don't cost a lot to make, and as great as these taste - it is a good thing because you'll want to make them all the time! A total winner in my book. And now I can never go back to the "other" original bars. Lightly spray a 10x10 or a 9x13 baking dish with cooking spray. In a large stock pot, over low heat, melt the butter. Once it is completely melted, add 10 cups of the marshmallows. Stir constantly until the marshmallows are melted completely and smooth. Turn off the heat and stir in the cereal until it is well coated. Fold in the 4 cups of marshmallows so they are distributed throughout the cereal mixture. Pour into the baking dish as evenly as possible. Cover with wax paper and press to fill in the corners of the pan and even out the krispies.